On 18th March EASST partners PA ‘Road Safety’ Kyrgyzstan coordinated a meeting of Bishkek’s Pedestrian Safety Working Group to present the results of their data analysis for 2018 on the number and causes of road traffic incidents involving child-pedestrians, and highlight the value of effective data analysis for improving pedestrian safety in the city. The Working Group, which includes specialists of the Transport Department of the Bishkek Mayor’s Office, the Head of the Department of Architecture and Bishkek’s City Traffic Police, was set up in October 2018 as part of the project, supported by the British Embassy, to explore the extent of the risk to child-pedestrians and recommend measures to ensure their safety on the roads. The results of the analysis, which was based on local traffic police data, found that just last year, 335 child-pedestrians were injured and one was killed in the city. This means that a child in Bishkek is 15 times more likely to be hit by a car than one in London. In accordance with data published last year as part of EASST and PA Road Safety’s research into pedestrian safety in Bishkek, it was once again found that a relatively small proportion of specific locations in the city were behind the majority of incidents, with Akhunbaeva street in particular accounting for no fewer than 16 incidents involving children. During the Working Group meeting PA Road Safety and EASST Regional Director Serghei Diaconu highlighted the importance of using pedestrian data for strategic decision-making, to analyse black spots and develop plans to improve road crossings. Road safety engineer and EASST Expertise Director, Matt Chamberlain, has visited Bishkek to inspect five of the most high-risk crossings identified as part of PA Road Safety’s work on pedestrian safety, and with the support of the Safer Roads Foundation and in partnership with the Bishkek City Hall, we will be installing safer road infrastructure to make the crossings fit for purpose for pedestrians in 2019. 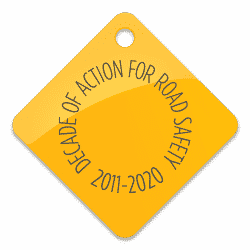 As part of the project, PA Road Safety have also been using the EASST Road Safety Education Pack to teach over 1,000 children living in these high-risk areas the importance of keeping safe on the roads, and giving them the skills and practical knowledge to help them take care.